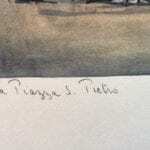 If you find duplicates, note that they are different numbers in a series of original lithos. Probably Donald Bonnist purchased these directly from the artist in the 1950’s. Full sheet measures 12 3/8″ x 14 1/2″. The fine quality paper is NOT pink as it appears in some images. It is off white and the condition is clean. Franz Herbelot (as copied from WikiAnswers, no guarantee of it’s authenticity but the most info available). A street painter famous for Parisian scenes. Herbelot is possibly only a pseudonym. He (or possibly she) was active in Paris around the period from 1940 to 1960. Herbelot first made rough on-site street sketches which were unsigned and bear only the location name. 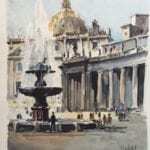 These sketches were later reproduced in his studio. 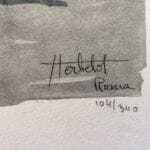 It is the lithograph prints and the line drawings with watercolors added which bear his “Herbelot” identity and issued numbers. There were two originals. The street sketch and subsequently the Lithograph master for reproduction with the added identity. 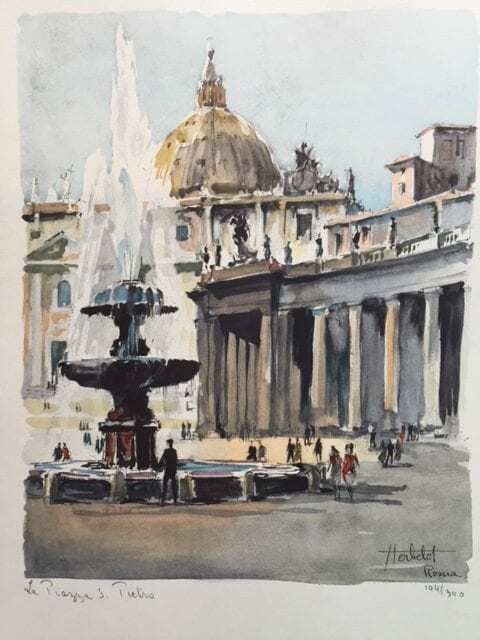 The original watercolor street sketches are the most inspiring as they have hidden depth that is lost when the sketches are finalized on Lithographic plates. Lithograph reproduction was the intention, producing many copies of desirable scenes to sell to tourists. The lithograph process produced a finished article that was comparable to a watercolor original.